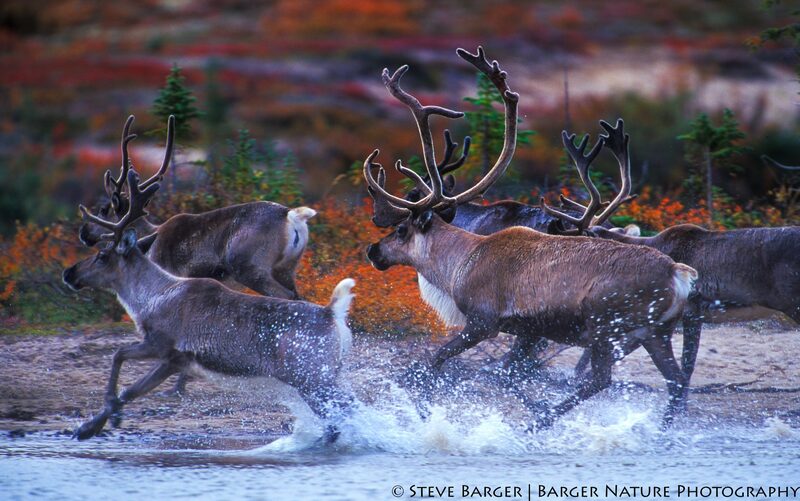 Caribou herd crossing the Thelon River in Northwest Territories Canada. 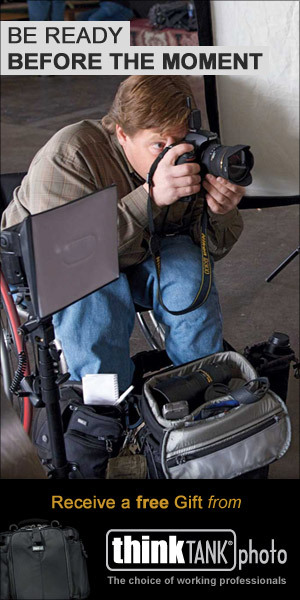 Several years ago while preparing for a trip to Whitefish Lake located in the Northwest Territory of Canada, I was considering possible photographic opportunities that would be available. Since this would be my second visit to the area, I was familiar with the area and possible subjects. With this trip scheduled during the fall season, I knew that there would be opportunities to capture wildlife with the tundra in fall color as a backdrop and the aurora as it spanned across the sky. Whitefish Lake is the source for the Thelon River. Since the migration routes of the caribou extend through the area, and I would be in the area for two weeks, I felt that the opportunities to capture the caribou herds as they crossed the Thelon River were good. During the first week of my visit, I was able to capture caribou and muskox with the fall color of the tundra. The aurora was present nightly. There was one evening when the aurora appeared in the sky shortly after sunset so there was an orange band of color in the sky directly above the horizon. At the end of the first week, although happy with the images captured, I was unable to capture a good river crossing. While presented with opportunities, I felt that the caribou river crossing images captured during the first week were static, lacking good action. I hoped that the next week would have better opportunities. The start of the second week proved no better than the first week when it came to producing caribou river crossing opportunities. It was not until two days before we were scheduled to leave that I spotted a small herd of caribou crossing the Whitefish River from the air while returning from a successful muskox photo session. Since the caribou crossing was located next to a camp that had been used in the past, I was able to convince our guides to take us to the camp and spend the night. My plan was to get up early the next morning and set my camera, 500mm lens, and tripod behind a bush next to the river and wait for the caribou to cross. I knew this was a long shot, but it would be my last full day so I had nothing to lose. Early the next morning, after only a few hours sleep, I set up my camera rig behind a bush close to the river shoreline as planned. As I laid down on the ground behind the bush it began to lightly rain. Fortunately, I was wearing rain gear and had my camera and lens protected with a rain cover. Tired from lack of sleep the past couple of weeks, I decided to use my camera backpack as a pillow and take a brief tundra nap. Big mistake. Twenty minutes later I awoke to the sound of thundering hooves. There was a herd of caribou were approaching the river intent on crossing directly in front of my position. By the time I could get up and position myself behind the camera, the caribou were across the river. Since caribou are vulnerable when in the water, they wasted no time in crossing. My negligence had cost me a wonderful opportunity to capture the river crossing image I so desired. Although upset that I allowed myself to miss a wonderful photographic opportunity, I decided to keep \my position, stay awake, and see what other opportunities would unfold. During the next hour, I had two muskox and a wolf pass by directly across the river. Maybe my luck was changing. It did not take long before I could hear the sound of thunder hooves behind me. Sure enough, there was a herd approaching the river. This time I was ready! With the exposure set, a fresh roll of film in the camera, and lens prefocused, all that was left was wait for the caribou to jump in the river in front of me. I was able to capture a series of shots of the herd crossing in front of me. Finally, my diligence paid off. This is my favorite image in the sequence. This image was used as the cover of the book titled “Caribou and the North, A Shared Future” by Monte Hummel and Justina Ray.